While the real aim should be to abolish the party system altogether, political parties must be indulged for the present time. They’re like that kid with hockey net who nobody likes. And somehow, even though highly undemocratic, they are paradoxically a feature of self-proclaimed democracies around the world. But I digress… This simple chart helps illustrate where the four major Canadian federal political parties stand on selected issues. It’s quite straightforward: the checks and crosses indicate a FOR or AGAINST the corresponding issue. It makes no declaration about whether it is GOOD or BAD to be for or against said issues. The check does not indicate whether they have the “correct position” on an issue. There is no judgment here. Just the facts. Pure, unadulterated objectivity. For example, the first issue is the environment. Does the Green Party support the environment? Well, sure. That’s pretty evident. But do the Conservatives? Well no, not really. Is that a good thing or a bad thing? That’s up to everyone to do decide on their own. Categories: politics, Uncategorized | Tags: Canada, politics | Permalink. 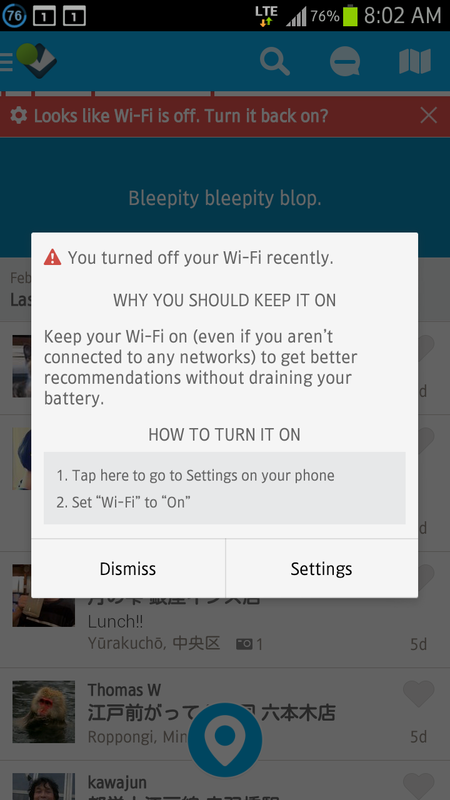 Foursquare’s suggestion that you should keep your WiFi on at all times is, in a word, wrong. Apps that require location services, such as Foursquare, are already an added drain on “smart”phone battery life. To keep your WiFi constantly searching for new connections is ridiculous. Perhaps whoever writes these tips for Foursquare are the same guys responsible for their terrible UI. I made this so my friends would not need to post anymore “Some Ecard Keep Calm Dare to Post” messages on Facebook. Be comfortable while you make yourself feel good about yourself. My first foray into Adobe Premiere Pro.